Clothing/Colors. Objective: Students will learn the ten basic colors and major pieces of clothing. Download "Clothing/Colors. Objective: Students will learn the ten basic colors and major pieces of clothing." 1 Clothing/Colors Objective: Students will learn the ten basic colors and major pieces of clothing. Materials: vocabulary cards (go to for flashcards of various sizes), several sets of small vocabulary cards Vocabulary: color black clothes dress gloves hat blue brown shorts pants sunglasses watch green orange socks shoes umbrella purple red coat scarf slacks yellow white shirt t-shirt swimsuit hat ring tennis shoes Session One: 1. Introduction: Show various pictures of people. Today we are going to talk about clothing. Show some of the pictures. What are they wearing? Or just ask various students what they are wearing. 2. Instruct and Model: Teach the vocabulary. Do the colors first. Point to colors as you say the word. Show the pictures, or real clothes, or point out the clothing on others while they say the words. Work on the pronunciation. Quiz them by holding up pictures or pointing and having them say the word. I am wearing. He (she, they) is (are) wearing. Add colors to the sentences to describe the article of clothing. 3. Divide class into smaller groups with a teacher at each group. Play this game. SLAP IT. Put the cards with pictures of clothing on a desk and the students sit around the desk. The teacher starts by just saying an article and then moves into describing a use and when a student thinks they know the answer, they slap the card and say the word aloud. If they are right, they get a point for their team. If they are wrong, they are out. Or in each group each student plays for themselves and if they slap the correct picture they keep the card as a point. The person or team with the most cards/points wins. 4. Students get into pairs or small groups. Students point to one article of clothing from the vocabulary list and their partner says the word. They can move on to describing the use while their partners try to guess. Take turns. They may not use Chinese, the name of the item, or give spelling hints. Take turns giving the hints and guessing. 2 Session Two: 1. Jazz Chant: These Are My Blue Jeans That s my shirt This red shirt? No, that brown shirt. Those are my shoes. These brown shoes? No, those black shoes This is my jacket. That green jacket? No, that blue jacket. That s my t-shirt. This white t-shirt? No, that red t-shirt. These are my jeans. Those black jeans? No, these blue jeans. Those are my shorts. These green shorts? No, those white shorts. 2. What is he/she wearing * Point to a student and say: He is wearing. She is wearing. They are wearing. etc. (Model the idea of repeating after me) * Continue this exercise around the room with each of the students. If a student makes a mistake, touch your ear to signal that the student should listen and then repeat his/her answer accenting what the student should have said. To increase the difficulty have the students include colors when it is possible. 3. What and Who Practice Put the class into groups with a teacher in each group. The students are to continue to ask what and who questions to the students and have students ask questions to each other, be sure to also vary the questions using you, he and she. What is he/she wearing? She is wearing. What am I wearing? You are wearing. What are you wearing? I am wearing. Who is wearing? is wearing. 3 Session Three: 1. Quickly review colors and clothing. 2. Teach The Clothing Song (tune of : Head Shoulders, Knees and Toes) 3. Dialogue: 4. Game: The Clothing Song Hats and gloves and scarves Watch and bag and sunglasses Now were ready for the day, for the day That is a nice (pretty, cute, cool) you are wearing. Thank you. I bought it at the store (market) What are (will) you wearing (wear) tonight (tomorrow)? I am wearing. That sounds nice (great). See you later. Good-bye. Upset the Closet: The student without a chair yells out an article of clothing or a color and the students with those colors or article on have to move and find a new seat (one student being unable to find a seat that student is the one who will call out the next words). As the game progresses you may do 2 or 3 articles at a time. When someone says Upset the Closet then everyone has to get up and move to a different seat... and not the one right next to them. 4 Additional Ideas Games: Clothing Race Purpose: Practice the names of clothing items. Materials: Two sets of clothing items Students are divided into teams of 4 or 5 members. Two teams compete against each other at a time. Each team lines up by a pile of clothes. When the teachers says Go! the first person in line, puts on a clothing item, says what it is and then takes it off and hands it to the next person. That person puts it on, says what it is and hands it the team member behind. While this is going on, the first person grabs another item, puts it on, says what it is and takes it off, handing it to the person behind her/him. When the last person on the team has put on all the clothes, said what they are and put them back in a pile, that round is over. The team who is faster, advances to the semi-finals or final round to compete against another team in the class (if the class has more than 2 teams). The judges can be students who are on teams not currently participating or student helpers. Picture Race Use pictures of clothes from the collection you brought in. Assign 10 pictures to groups of about 5 students sitting in a circle. Working individually, they will compete to write brief descriptions of as many pictures as they can in 5 minutes. Then share the results with the class. What Am I Wearing Objective: identify clothes, styles, colors, shapes Before class I draw a circle on the board with four air bubbles coming from it and in each write summer, winter, spring and autumn. When I enter the classroom I wear a hat, scarf, gloves, coat etc and we talk about the various garments. Explain garments, clothes, dress etc. In groups brainstorm different clothes for the seasons. Change groups around and new group s complete questionnaire about clothes, a pair of shoes, gloves, pajamas etc. 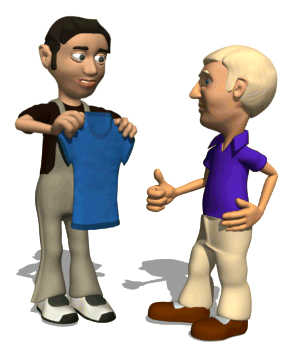 Have a discussion about students' favorite clothes, fashions, can they wear what they like or what their parents choose, etc. 5 Clothing / Colors Vocabulary: color black clothes dress gloves blue brown shorts pants sunglasses green orange socks shoes umbrella purple red coat scarf slacks yellow white shirt t-shirt swimsuit ring watch tennis shoes Jazz Chant: These Are My Blue Jeans That s my shirt This red shirt? No, that brown shirt. Those are my shoes. These brown shoes? No, those black shoes This is my jacket. That green jacket? No, that blue jacket. That s my t-shirt. This white t-shirt? No, that red t-shirt. These are my jeans. Those black jeans? No, these blue jeans. Those are my shorts. These green shorts? No, those white shorts Dialogue: What is he/she wearing? She is wearing. What am I wearing? You are wearing. What are you wearing? I am wearing. Who is wearing? is wearing. Circle Time Songs 1. The More We Go Together 2. I Can Read Colors 3. I Like To Eat 4. BOOM CHICKA BOOM 5. We're So Glad 6. Be My Friend 7. Where Is Thumbkin? 8. Colors 9. Here I Am 10. Hello Everybody! Unit 2 Unit 2 A. LOGGING ON 1. Goals: In this unit: You will learn how to describe people s physical appearance. You will practice: Third person singular e.g. She looks great! Order of adjectives e.g. Appearances. Unit. Before you begin... Look at the picture. Can you find someone who... has long hair? has short hair? is young? is old? Things are different Level: 3º E.S.O. Grammar: Order of adjectives in the sentence. Comparatives and superlatives. Comparative and superlative sentences. Functions: Describing clothes. Asking for clothes. Hello song: Hello, hello, hello *3 I am Sue Hello, hello, hello *3 I am Jack Goodbye song: Goodbye Jack and Sue. Goodbye Jack. Goodbye Sue. Goodbye Jack and Sue. Elephants and fishes: How many elephants/fishes? GWES Name 1-Adonis 2- Alexandria 3-Anthony 4-Ashanti Description of Snowman My snowman has a black and purple hat. My snowman has round blue eyes. He looks scared. My snowman has black dots on his mouth. WILL YOU PLEASE, PLEASE SMILE? LOOK LIKE? WHAT DOES SHE. Preview PERSON DESCRIPTION A Listen. Circle the words you hear. Brain gym starters This is how quickly your brain forgets things Your brain is a muscle Like every other muscle it needs exercise Brain gym is one way to exercise your mind so that you can learn better. Second, advertise the event and make sure students bring a friend, wear dark clothes and bring a mini flashlight.